← Homemade Christmas is Best? Well, we are fast skidding headlong into the holidays, and are we ready? Not really. Deb ended up going back home to visit her sisters, which was an unexpected pleasure, but as it wasn’t planned too far in advance, it was a mad scramble. I am wondering how many things she forgot, but she hasn’t fessed up yet. [Deb here: I forgot NOTHING! I can’t believe it either! B.H. forgot his multi-tool and tweezers, which can be worked around.] I ended up starting a part-time job (no Friday or Saturday mornings EVER), but someone ended up getting sick, and I was putting in ten-hour days with no warning, and it sort of threw a monkey wrench into my plans, too. But, the fruit cake is made, the tree is finally decorated, and one of these days, I will get the rest of my presents wrapped. For our loyal readers, we have gathered our Christmas leftovers for the year, so here we go. 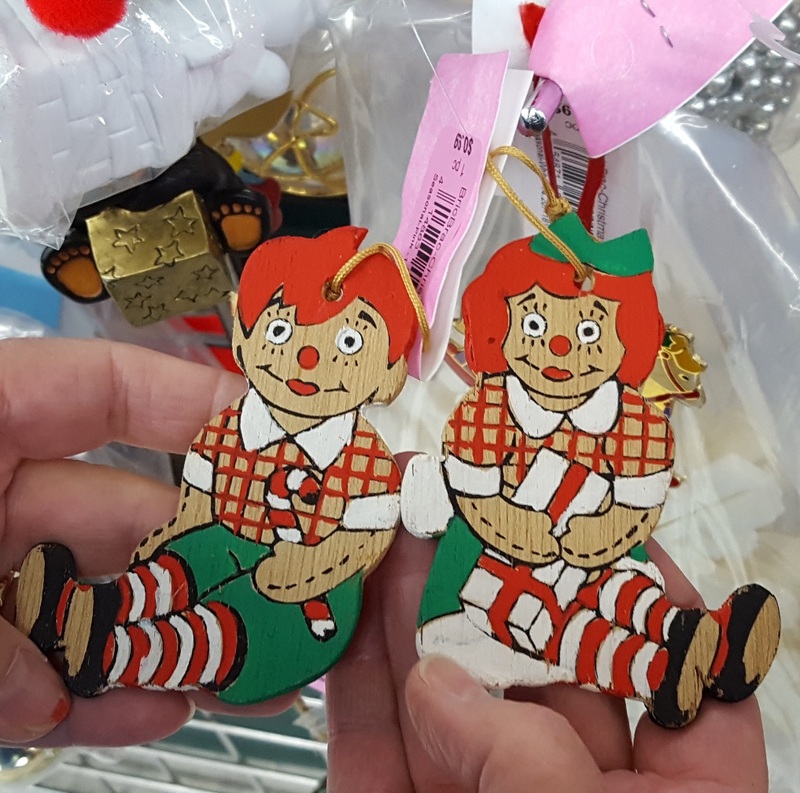 I have always felt that Raggedy Ann and Andy were a little creepy when done poorly, and boy, do these qualify. Where is their raggedy hair, and shouldn’t they have triangular noses? Santa would take one look at these and pass your stocking right by, so better toss them in the fireplace right now, just to be on the safe side. 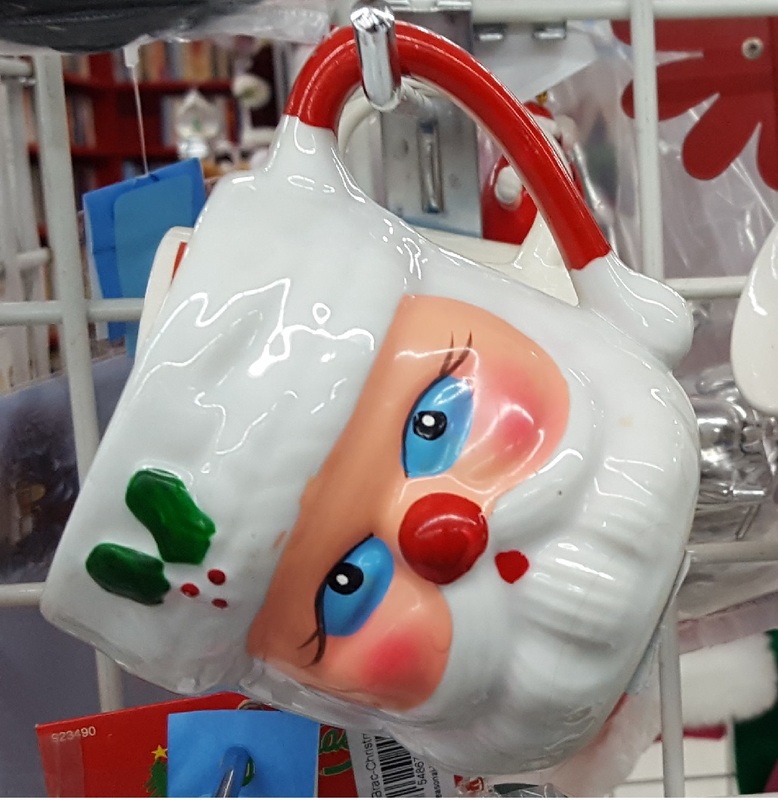 I’ve seen oodles of Santa mugs that are as cute as can be. Especially the vintage ones made in Japan, but these Chinese knockoffs have got to stop. I’ve seen worse, but I have seen much, much better too. The fashion dates it better than the box itself. Remember how cool this was when it first came out? 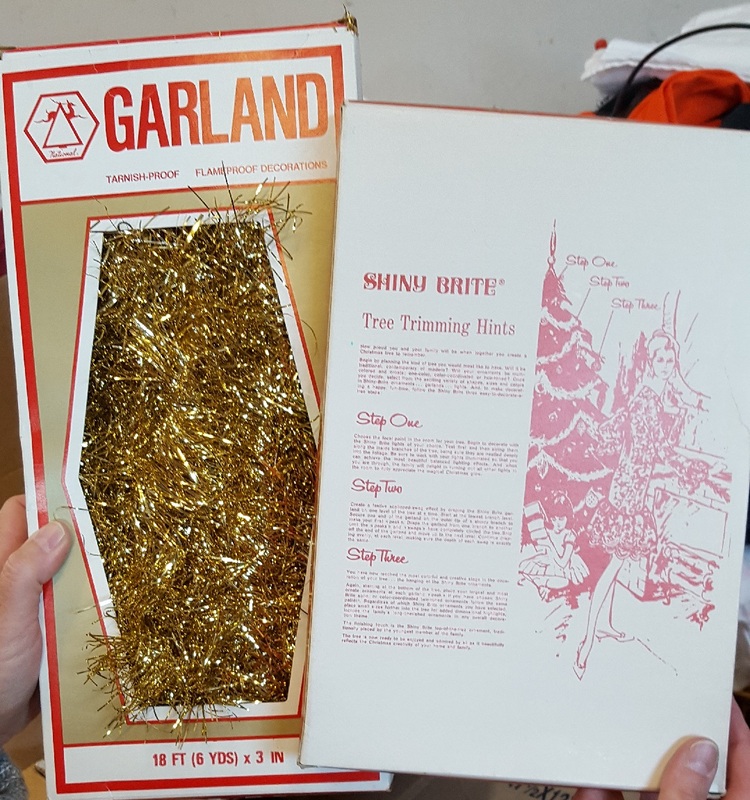 We rarely used it at our house, as we were busy feeding tinsel to the cats, but if I remember right, when we did have some around, they ate that, too. Bet that classy gal on the back never had that problem. We gotta admit, deep down, well, maybe not that far down, we actually like this. 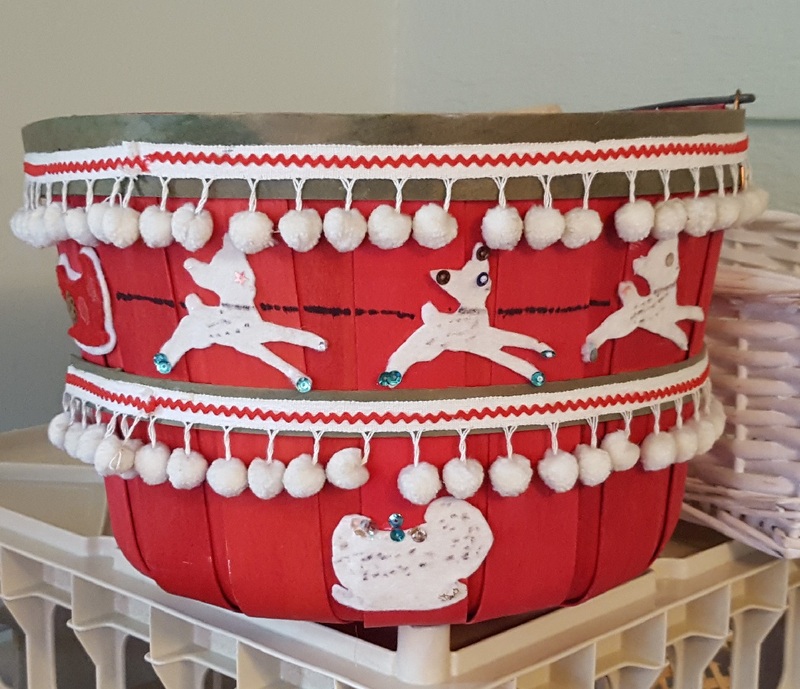 It could probably have been executed a little better, but golly, white pompoms on a cheerful red basket can still make just about anyone smile. 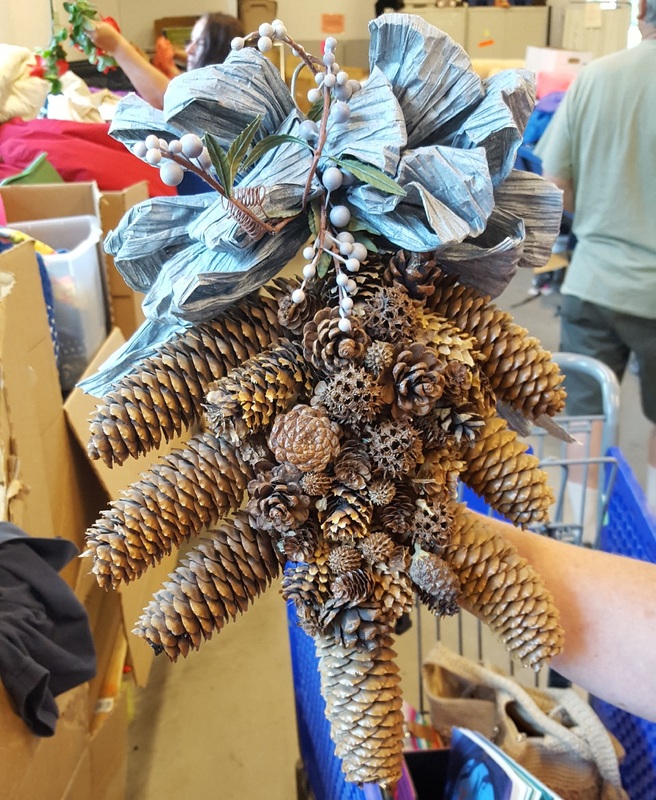 Not sure what you would use it for, but keep it around, fill it full of scented pine cones, and heck, it would get you by in a pinch. 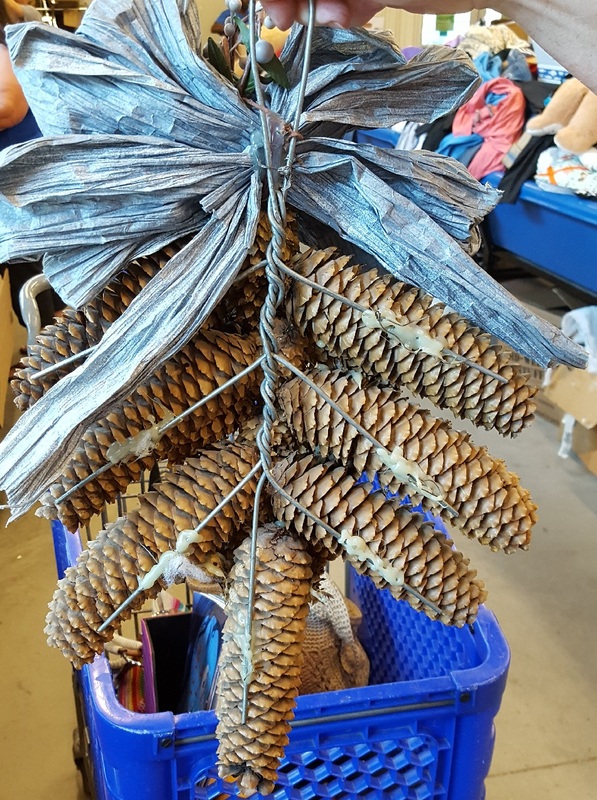 Maybe if they had left off all the eensy weensy pine cones it would have made more sense, and hopefully that bow started out life more green than washed-out blue. Maybe it was time to chuck the whole thing in the donation bin as a bad business, but why did you have to inflict it on the rest of us? This looks like Salvador Dali had a Christmas nightmare. The moon is a bit on the drippy side, and I am thinking that angel is not the tiniest bit happy sitting there. At least the look on her face seems to reflect that. Add to that, the eternal sin of being avocado green and there is no hope for this at all. I think Santa would rather fill an old smelly sock than this. 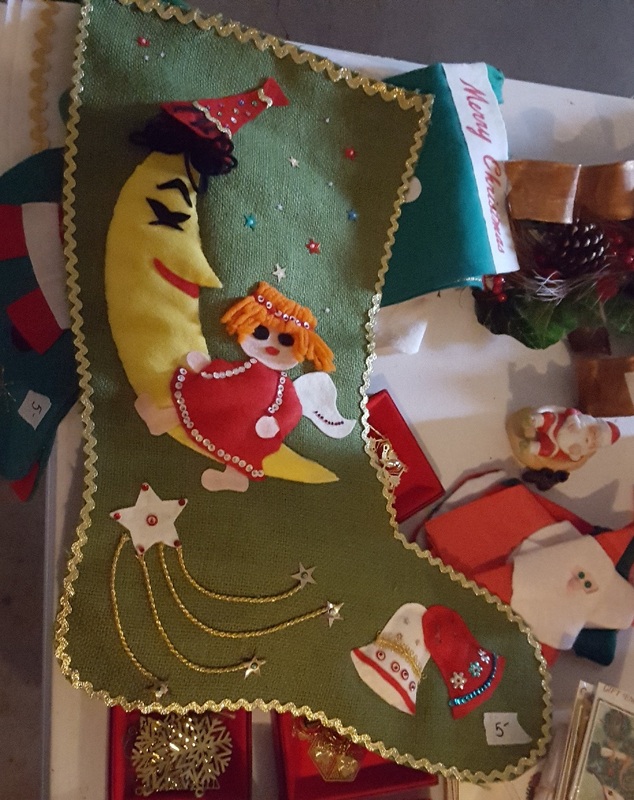 You should skip this stocking altogether and just leave him a nice hot toddy and I bet he would strew a few gifts your way, anyhow. 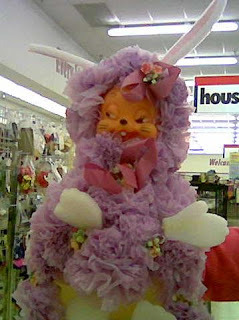 I am going to give it cute, but a HUGE pass as it was supposed to decorate the toilet seat. Nope, not gonna happen. Please just set a tiny tree on the back of the tank, put out a Christmas hand towel that no one knows what to do with, and call it good. We thought the “Hi” was a particularly creepy touch. Gives new meaning to Santa seeing you when you’re awake. He really looks like he has seen something that can’t be unseen. 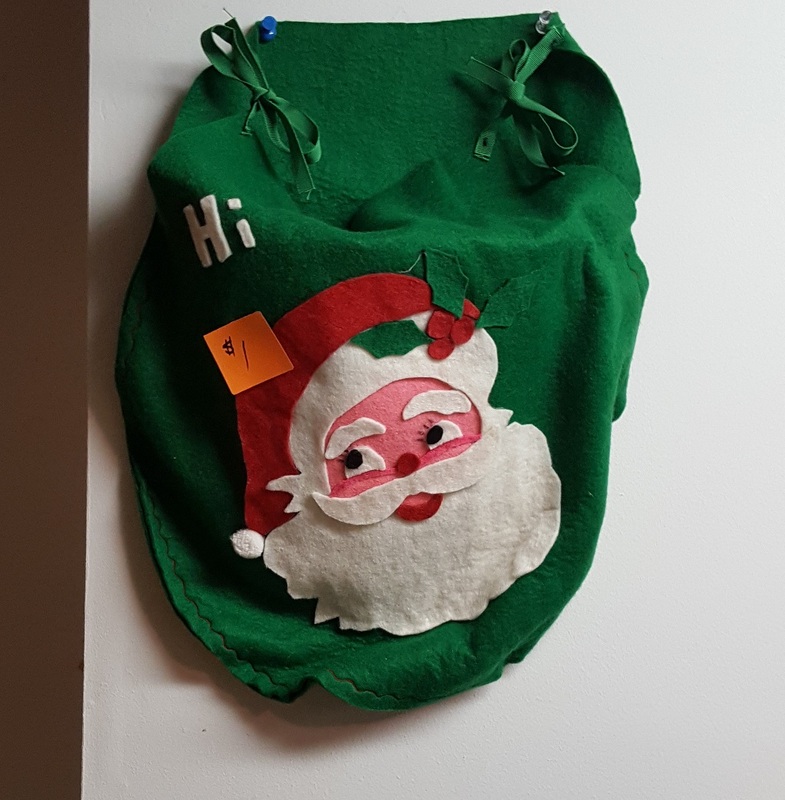 Probably the creepy Santa on the toilet got to him, or maybe the one in front of him, as if you look closer, you notice he doesn’t seem to have a face! Shades of the Halloween slinking in, and not in a good way. We know why the deer is not in front of this contraption. It’s the Kon-Tiki of sleighs, and we are not sure how snow worthy the whole thing is. All in all, as a festive decoration it just doesn’t cut the fruitcake. They look sort of forlorn sitting there, but I would have had to redo my entire decorating scheme to use that little tinsel one in back, and I just can’t get into the ceramic type in front, but being purple made it at least a little more bearable than the run of the mill variety of this conifer. We hope someone else was into having a lavender Christmas and took these home. What do you all think of that Santa lighthouse? The set was free, but oh my, blow molds are hard to store. If I was a meaner person I would have just taken the camel, but then who would have kept the baby Jesus and the sheep company? 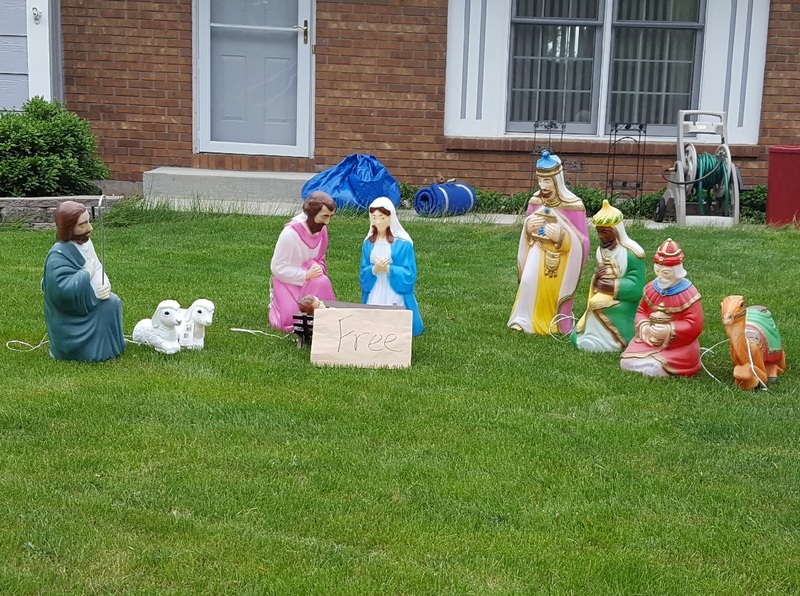 We were relieved to see someone loading it into their car by the time we left the sale, so it now has a good home, and will bring Christmas cheer or tacky decorating to some other neighborhood for many years to come. I decorated the medium-sized one with most of The Summer Intern’s flamingo ornaments for a pink and fluffy Christmas. Papa tree is covered in Shiny Bright and other time-appropriate ornaments, and the little baby tree just has some handmade felt ones. I sometimes do it in all tiny red balls, but just didn’t get that done this year. After you put up three of these, you know you have been somewhere, as they assemble one branch at a time. Even worse putting them away, as you have to insert each branch into its protective sleeve. 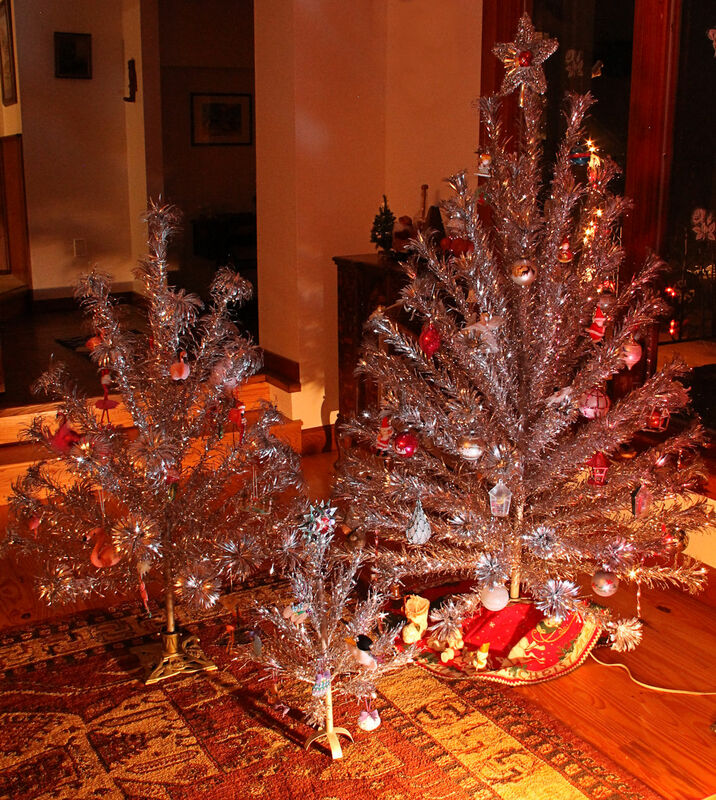 What aluminum tree fanatics won’t go through! 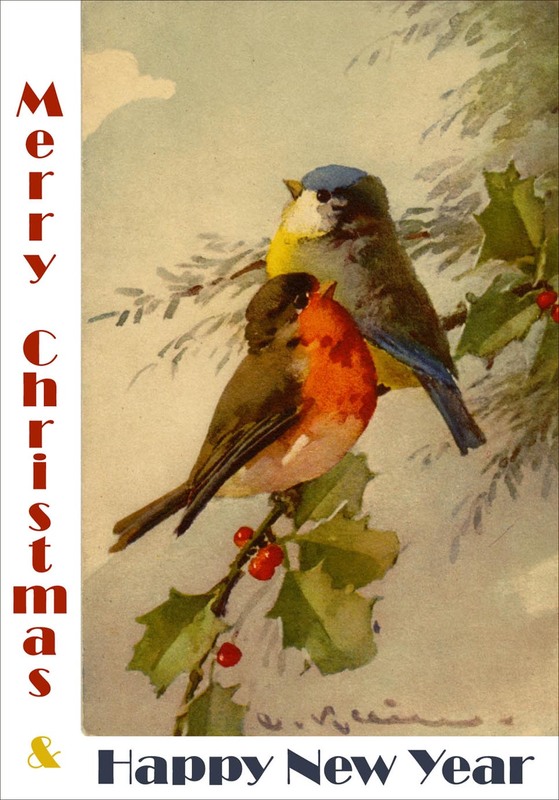 We wish all our loyal readers a Merry Christmas, a Happy Hanukkah, a Festive Kwanzaa, and a bright and cheerful New Year full of joy and happiness! 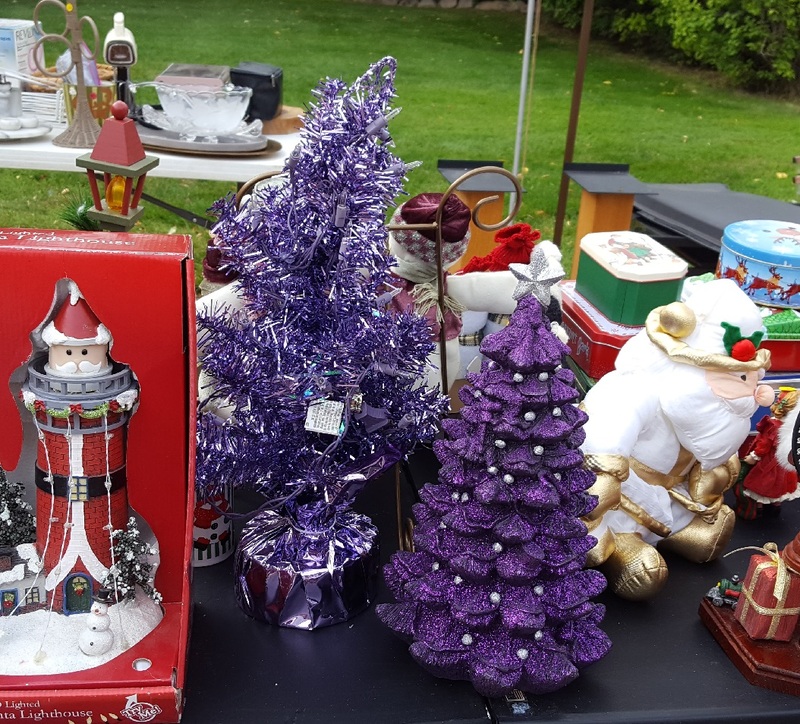 This entry was posted in Friday Finds, Holidays and tagged Angels/Cherubs, Bad Decor, Baskets, Christmas, Crafts Gone Wrong, Estate Sale, Thrift Store. Bookmark the permalink. Thank you Inger! The same to you!